Since foraging is the new farming, I thought ramps would be a timely addition to NK's vegetable hall of fame. Not familiar with ramps? Also known as Wild Leeks, ramps are a foraged green available for a very short period in early spring. A relative of the onion, they grow wild across the US, especially in the Appalachian region. In flavor, they are pungent and garlicky with both edible leaves and bulbs. For even more Neurotic Kitchen Ramp Recipes click HERE. Like most pretty things, they become that much more alluring when they're hard to get. Said to be the earliest green of the spring season, the scarcity of ramps definitely adds to their veggie celeb status. If you look around this time of year, you'll surely see ramps popping up on farm-to-table menus everywhere. If you're lucky enough to have a good farmers market or gourmet produce shop, they're likely to show up during that fleeting window in early April. They have a cult following among chefs and at home cooks alike, as evidenced by this article about retailers price gouging for these sought after beauties: Price Gouging of Ramps! 1 - Adding breadcrumbs to amp up the textural complexity of the dish. 2 - Adding a runny, poached egg, because, if you ask me, nothing is better than a runny, poached egg. First, let's make our Pangrattato, or breadcrumbs. The basic way to make homemade breadcrumbs is simply to let a good quality loaf of bread go stale over a few days. From there, you can grate it on a box grater until you have the desired amount of crumbs. If you are looking for a time-saving option, most good bakeries package and sell their fresh breadcrumbs. It's Monday, so you can bet I will not be grating bread on my own...Short cut time. Stir in breadcrumbs and thyme. Fry for about 3 minutes, stirring often, until golden brown. Set aside. 8 Ounces Ramps - white bulb ends cut off and green leaves cut in half or thirds & set aside. Boil Water in a large pasta pot and add 2 Tablespoons of Salt. While pasta is in the water cooking, heat Oil in a large skillet over medium high heat. Next, Add the white root ends of the ramps to the skillet and saute until tender. Add a bit of salt and chili flakes. Next, add the ramp greens and sauté until totally wilted - at least 5 minutes. Test the ramps by tasting. They can vary between tougher or more tender. If they are on the chewier side you can continue to cook. Once pasta is done, drain and add it to the skillet with the ramps. Reserve a half cup of pasta water in case you need to loosen the pasta later.Toss pasta with ramps to coat and turn heat down to the very lowest flame. To plate: Divide pasta among serving bowls, top with breadcrumbs, and carefully slide the poached egg onto the top of each bowl using a slotted spoon. ~Special thanks to my master egg poacher, Mr. NK. 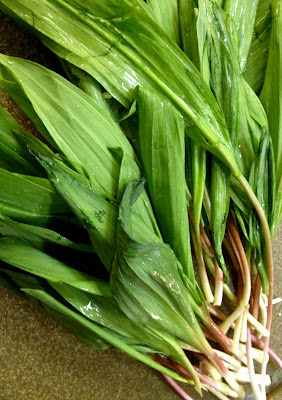 I'm getting wild ramps in this week's farm delivery, can't wait to try this! We are excited to hear it was a hit. If I had a dollar for every time I sampled food that I knew would burn my tongue. I'd be rich! Would love to say I live and learn but I am a bit too eager with the sampling.